November 12, 2017 at 5:16 pm. Alabama is unbeaten, No. 1 in the polls and gets everyone’s benefit of the doubt. On Saturday, though, it was the Crimson Tide’s state rival that looked the part of the national champion. 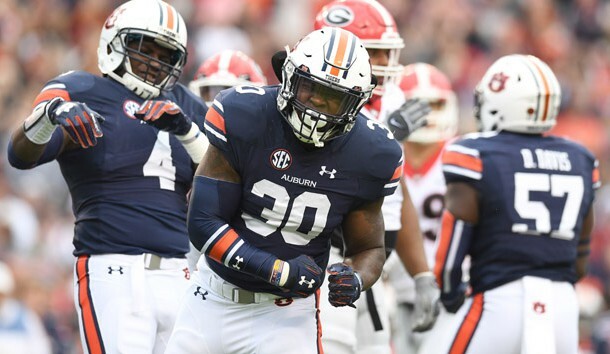 Auburn, sitting with two losses while quietly drafting off the college football rankings leaders, is ready to slingshot past the traffic and make a pedal-to-the-metal run to the finish line. A two-loss team in the College Football Playoff? It hasn’t happened yet, but there’s only been a three-year sample size and very few teams have had the opportunity to close the way the Tigers can. Step 1 after an Oct. 14 loss at LSU: Take care of business on the road against Arkansas and Texas A&M. Check: Wins by a combined 94-47. Step 2: Beat Georgia, No. 1 in the College Football Playoff rankings. Double check: Auburn dominated, destroyed and discombobulated the Bulldogs. “What we wanted to do as a defense was to come in and make a statement,” linebacker Deshaun Davis said after the 40-17 victory. Auburn was up 16-7 at halftime and just poured it on, unlike what happened when it squandered a 20-point lead to LSU. The Tigers held the Dawgs to 47 rushing yards and 230 overall. “I think the biggest difference is that we learned to finish,” said running back Kerryon Johnson. Step 3: Beat visiting Alabama in the Iron Bowl on Nov. 25. Winner takes the SEC West. Auburn (8-2, 6-1 SEC) is constructed the right way to beat Alabama (10-0, 7-0). The defensive line is strong enough to force Alabama to pass to win; Auburn can be balanced offensively and control the game with its rushing attack; quarterback Jarrett Stidham isn’t Johnny Manziel, but he’s nifty enough to make plays and not be a standing target against the Tide’s pass rush — an absolute must. “When he runs it just enough, I think it changes everything,” said Auburn coach Gus Malzahn. The Crimson Tide, dealing with multiple injuries at linebacker — that has to take a little bit of a toll even at Alabama — hadn’t been pushed too hard this season, until running into Mississippi State on Saturday night. Alabama needed to rally for a 31-24 victory to silence the cowbell. Credit to the Tide for doing so, but there’s not an “unbeatable” vibe coming off this team. Step 4: Beat Georgia again in the SEC Championship Game. That’s how a two-loss Auburn wins the SEC and gets into the four-team playoff — especially now that Notre Dame, flattened at Miami on Saturday night, is no longer in the race to muck things up for a Power 5 conference team. 1. The Miami turnover chain is awesome. The U is back. The swagger is back. And even if you have hated all that from the Hurricanes, dating to their glory days, you still have to love the joy and the passion — and the results — from their new, gaudy sideline bling, draped around the neck of the latest player to get a takeaway. Looking like kings in form and fashion, Miami has forced at least four turnovers in four consecutive games. 3. USC is back to rule the Pac. The Trojans, shaken from their doldrums after being slapped across the face by Notre Dame, once again look like the best, most complete, team in the Pac-12. They clinched the South division with a win at Colorado and, as hard as this is to believe, will now get a shot to win its first conference crown since 2008. 4. Does anybody want a Big 12 rematch? All Oklahoma has to do to clinch a spot in the Big 12 title game is win at Kansas this week. The other team in control of its destiny is TCU, provided the Horned Frogs pick up the pieces after being carved up by the Sooners on Saturday. TCU finishes with the doable two-step of Texas Tech on the road and home vs. Baylor. 5. The Pac-12 needs a better schedule-maker. Three teams from the league reached the Top 10 this season — USC, Washington and Washington State — only to lose in a Friday night road game on short rest. TV windows be damned; this is Exhibit A in how to needlessly hurt your chances for the College Football Playoff. 1. Oklahoma QB Baker Mayfield. Congrats, Baker. Have you picked out a spot to display your stiff-armed trophy? 2. Stanford RB Bryce Love. The nation’s leading rusher needed only one healthy ankle to rush for 166 yards and three touchdowns against a Washington unit that had been the FBS leader in total defense. 3. Arizona QB Khalil Tate. He’s the newer, shinier version of 2016 Lamar Jackson. After barely playing in the first four games, Tate has more runs of 70-plus yards (five) than any player since at least 2010. And he’s done that on just 111 carries, averaging 11.65 yards per rush. He went for 206 in three quarters Saturday night in a rout of Oregon State. 4. Louisville QB Lamar Jackson. He’s got all the numbers — including a national-best 417.9 total yards per game — but he never had his “Heisman moment” as he did a year ago against Florida State. But he must be invited back. He’s the only player ever to have back-to-back seasons of 3,000 passing yards and 1,000 rushing yards. 5. North Carolina State DE Bradley Chubb. Some love for the defense: 10 sacks, 22.5 tackles for loss and arguably the top defensive prospect for the 2018 NFL Draft. Waiting in the wings, with big-opportunity games ahead of them: Auburn RB Kerryon Johnson, Wisconsin RB Jonathan Taylor. 1. 3 — 500-yard rushing efforts in the past 11 games for Arizona. Whatever you think of coach Rich Rodriguez, the dude is still the king of the zone-read offense. 2. 3 — Times in the past six seasons that Tennessee has started 0-6 in the SEC. 3. 6 — Consecutive victories for Army, its longest in-season streak since 1996. The triple-option Black Knights, brilliantly guided by quarterback Ahmad Bradshaw, attempted one pass Saturday in a win over Duke. It was complete for 42 yards. 4. 14 — Years it will be that Miami last played a game ranked in the national top 5. That will be the case Saturday when the Canes play Virginia. 5. 16 — Years it had been since Kentucky beat an SEC opponent by more than three touchdowns. The seven-win Wildcats beat Vanderbilt 44-21 on Saturday. 1. Michigan at Wisconsin (Saturday, noon ET) — The Badgers, coming off an impressive pounding of Iowa, are going to play in the Big Ten title game — and if they beat the Wolverines, it will definitely be against Ohio State with a playoff berth on the line. 2. UCLA at USC (Saturday, 8 p.m. ET) — Sam Darnold. Josh Rosen. Good enough. 3. Navy at Notre Dame (Saturday, 3:30 p.m. ET) — This might be a good time to mention that Saturday’s slate of games is the supposed calm before the final-week storm (a nice way of saying there’s a dearth of high-stakes clashes), but this matchup can stand on its own. Navy, backed by the wickedly-good coaching of Ken Niumatalolo, has won four of the past 10 meetings, including last season. 4. Florida International at Florida Atlantic (Saturday, 7 p.m. ET) — It’s the Conference USA matchup you didn’t know you wanted — FIU’s Butch Davis vs. FAU’s Lane Kiffin. Both teams are bowl eligible, and Kiffin’s kids have won six in a row. 5. Kentucky at Georgia (Saturday, 3:30 p.m. ET) — Worthy to see how the Bulldogs respond and if Kentucky can cause further chaos while winning its eighth regular-season game for the first time since 1984.